In April, we gathered in Columbus at the Westin Columbus — the beautifully restored historic Great Southern Hotel — for the first-ever pet blogging and social media conference. 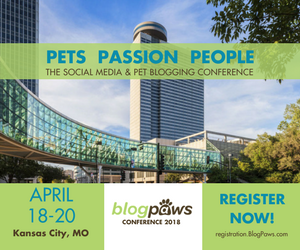 More than 230 bloggers, writers and companies passionate about pets came together for networking, learning and fun — and giving back. A challenge was issued by the fabulous women of the BlogPaws Be the Change for Pets team. And a tradition was established with donations to pet shelter and rescue organizations, made possible by the generosity of both the attendees and the sponsors. The Denver Conference was bigger and by many accounts better in a number of ways. We had over 260 attendees and two full days of educational programs, preceded by an opening night reception that featured Kyla Duffy’s aerial Up For Pups presentation. With help from sponsors Iams and Eukanuba, we streamed LIVE from several of the general sessions. And in yet another first, BlogPaws presented the first Dogtime Pet Blogger Awards — the Petties! (Petties Award ceremony video here.) Congratulations again, to all the winners and nominees.